The Mega Commander by Hori is a simple third-party six-button controller for the Sega Mega Drive, complete with added turbo features, with three speed settings for each button (normal, turbo and hold) and two slow-motion modes. 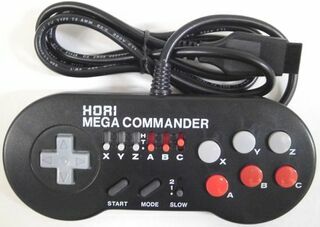 It has the same design and layout as Hori's previously released Fighting Commander controller for the Super Famicom, which in turn was based on the standard Super Famicom controller, but with the L and R button on the front side. The button is placed next to the button, similar to the Select and Start buttons on the Super Famicom's controller.